When at least seven Hindu pilgrims were massacred by Islamic terrorists in the Kashmir valley on the first Monday of the month of Shraavan, it elicited widespread grief and anger in many. Kashmir valley had already seen horrible acts by the Islamic beasts in recent past with killing of an unarmed Army jawan Umer Fayaz and gory public lynching of DSP Ayub Pandith, which also had elicited anger and people wanted the killers to be brought to justice. The attack on unarmed Amarnath Yatris, who had gone to Kashmir out of their devotion to Lord Shiva, added to this already fuelling anger. The fact that most of those killed were women infuriated people even more, who wanted the government to bring the killers to justice. While the common man was angry, the secular-liberal establishment was busy worrying about a myth called Kashmiriyat. It infuriated the angry people even more. Did Hindu lives not matter? If a Hindu is killed in Kerala, people talk about “political context”. If a Hindu is killed in West Bengal, people worry about “BJP may benefit”, and now when Hindus have been massacred in Kashmir, the immediate concern becomes “Kashmiriyat”. The Home Minister of the country, especially when he is from a political party alleged to be the only party concerned about Hindus, is expected to understand this anger and assuage it. However, the Home Minister too decided to pontificate about Kashmiriyat, instead of talking about strong response and attack on the faith of those who wanted a glimpse of Lord Shiva in Amarnath caves. The angry tweet, which was used by Rajnath Singh to earn liberal cookies. It is clear that Shuchi was demanding action against the terrorists. She was not even dismissing the concept called Kashmiriyat – which we at OpIndia.com dismiss as an imaginary construct – but she was just telling the home minister, in angry words, that the priority has to be of teaching the terrorists a lesson than giving lessons in Kashmiriyat to the common citizens. But our Home Minister decided to distort her view. Not only he reiterated his romantic support to an imaginary idea – which he is fully entitled to – he virtually accused Shuchi of branding all Kashmiris as terrorists when she was clearly not making any such claim. How is Shuchi being any different in her demand than senior BJP leader and current External Affairs Minister Sushma Swaraj, when she had demanded to “bring 10 heads from Pakistan” to avenge the death of one Indian soldier? Even though Swaraj had not explicitly mentioned heads of Pakistani soldiers or terrorists, any sensible person would know that Swaraj definitely was not calling for heads of any ten random Pakistanis. Good that Rajnath Singh was not the Home Minister back then, else he would have branded Sushma Swaraj a hateful violent troll wanting to kill entire Pakistani cricket team except the wicket-keeper, maybe because he used to drop catches. We all know what a humanitarian and compassionate person Sushma Swaraj has turned out to be. But she could easily have been branded a genocidal maniac if her words were twisted back then (and I am sure many would have attempted to do that). That’s what Rajnath Singh did and he succeeded in his attempt. He twisted Shuchi’s words and indulged in virtue signalling. This gave the secular-liberal mob a reason to pounce on Shuchi. With Home Minister’s distortion of her tweet, she was branded a “violent hateful troll” who wanted a genocide in Kashmir. This online lynch mob not only harassed her by calling her such names, they even tagged her employer MakeMyTrip, in an attempt to take away her job. This is typical of a secular-liberal mob. They not only kill your character, they try to kill your source of livelihood too. 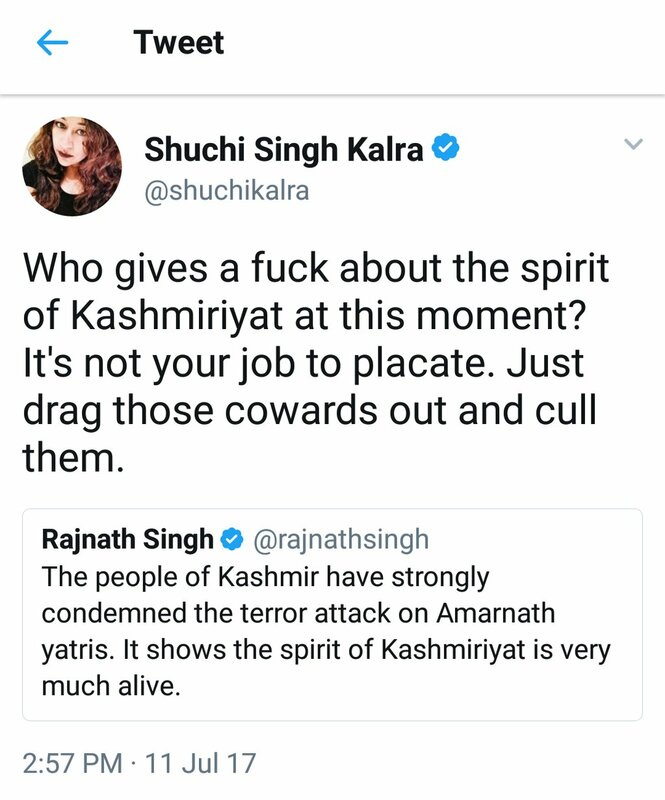 Once the hounding began, Shuchi not only deleted the tweet, she deleted her Twitter account itself, but the bloodthirsty lynch-mob was not satisfied. The news portals controlled by this lynch-mob churned out one report after the another, and a self-accomplished woman was defamed and humiliated, just because she was anguished at deaths of some innocent pilgrims. While a private citizen had to go through this organized bullying and character assassination, the Home Minister basked in glory and collected character certificates from people who are closet Jihadist and professional distortionists i.e. journalists. If the objective of Home Minister Rajnath Singh was to get applaud from the mainstream media and from people who are scared of a common man’s views, he has succeeded. But he has failed as member of a party that is supposed to understand the digital medium and value online support. He has also failed as the guardian of common citizens, for he, instead of assuaging anger, threw a woman to wolves. Is this the way a Home Minister is supposed to behave when a common citizen expresses his or her anger? Was it so difficult to ignore the tweet if he doesn’t share the same grief and fury over killing of fellow citizens? And what should we conclude if the Home Minister from a so-called nationalist party doesn’t feel the same pain and fury?